Do you see what's happening here? It's a tree being very much supported by a metallic, yellow arm a.k.a. the West Hollywood Street Maintenance. It's like a crutch for the tree. 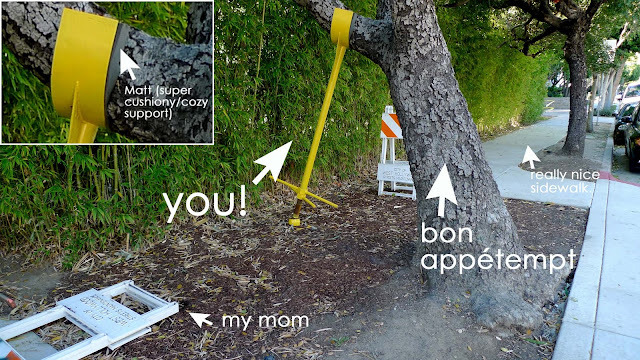 Plus, they literally moved the sidewalk to go around the OUTSIDE of the tree, and then gave it a nice yellow crutch just because. No, I didn't knock down the one orange and white striped stand thing just to make fun of my lovely mother for not reading the blog. It was way down (much like my parents' readership) when I happened upon it. OK, now. Moving on to Thanksgiving! 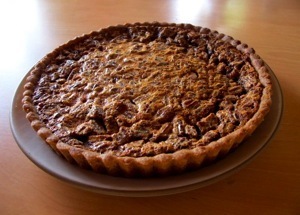 If ever there was an exact opposite of Marilyn's liver-y stuffing, it was this pecan tart. Instead of laborious egg peeling, vegetable chopping and liver boiling, there was a press-in crust, pecans, and some butter-browning. Instead of the appetite-crushing wet dog smell, the apartment filled with the warmth of toasted pecans and melted butter. And no tart pan? No problem. I used the springform one I acquired for the Ina Garten cheesecake attempt. Also, I couldn't find the golden syrup the recipe called for, but substituted (the ever present) corn syrup without issue. 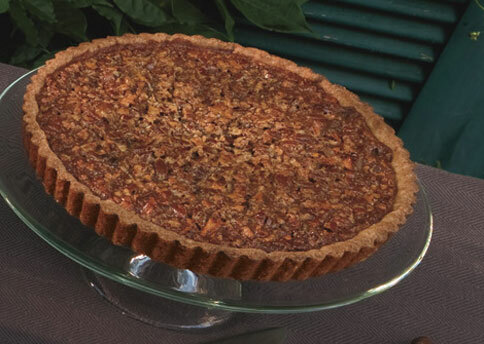 By the way, many thanks to Jeanne Kelley, who I ran into the day after I'd made Marilyn's stuffing and who must have seen the disappointment in my face when I described the dish to her because as I went on to explain I was looking for a good pecan pie recipe, she mentioned this one. She could tell I needed an unfussy success, something that would inevitably deliver. And well, just look at that tart. Thanksgiving dinner was very special. We spent it with some of our very talented and culinary-minded friends whose guest attempt is soon to come(!). Food, friends, (football? ), fizzy wine, and a fire equaled one of my favorite Thanksgivings to date. So many thank yous to everyone! A press-in crust eliminates the (sometimes tricky) steps of rolling out the dough and transferring it to the tart pan. Instead of rolling, just combine the crust ingredients and press the sandy, crumbly mixture onto the tart pan. Start in the middle and work outward, or—if you're concerned about running out of crust as you go up the sides—start with the edges and work inward. That way, you'll have plenty of dough to form edges of uniform thickness for a pretty presentation. Look for golden syrup at some supermarkets and at specialty foods stores. Cook 3/4 cup butter in heavy small saucepan over medium heat until butter turns golden brown (nut-colored), watching carefully to prevent burning, about 4 minutes. Remove from heat. Pour melted brown butter into 1-cup glass measuring cup. Let melted butter stand until barely warm, 15 to 20 minutes. Meanwhile, position rack in center of oven and preheat to 375°F. Butter bottom and sides of 9-inch-diameter tart pan with removable bottom. Whisk flour, brown sugar, and salt in medium bowl to blend. Add 1/2 cup of barely warm melted brown butter and stir with fork until moist dough forms (mixture will resemble wet sand). Transfer dough to prepared tart pan. Using fingertips, press dough firmly and evenly onto bottom and up sides of pan (dough will look glossy). Let crust rest 5 to 10 minutes at room temperature. Bake crust until set and just golden brown, 15 to 18 minutes. Meanwhile, whisk egg and brown sugar in medium bowl until well blended. Whisk in golden syrup, whipping cream, and salt. Stir in remaining melted brown butter, leaving most of darkened solids behind in bottom of measuring cup. Stir in pecans. Pour filling into warm crust, distributing pecans evenly. Bake tart until filling is browned and slightly puffed and set at edges (center will still move slightly when pan is gently shaken), 25 to 27 minutes. Cool tart completely in pan on rack (center of filling will set as tart cools). DO AHEAD: Can be made 1 day ahead. Cover loosely and store at room temperature. Great Thanksgiving! And I run by that tree all the time -- they literally pulled up the sidewalk and moved it to go around the tree. I'm all for it, but it is a suspicious amount of attention for one tree, no? Hilarious, as usual! I love the tree crutch. The pie sounds great too! love! super duper cozy. and i will make that pecan tart pronto! the pecan tart was RIDICULOUS. i actually don't think i will ever make a pecan pie again. That tree is getting a lot of support from West HOllywood! LOL! I give thanks for Bon Appetempt's every monday morning! ok, so i don't know what's better - the metaphor or the pecan praline tart?! both totally genius!